Laura Florand crafts these moments so delicately that they drift down on the reader like so much fairy dust, making your heart throb in time to the beat of her words. In each book in this series, I can pick out that scene, that moment where everything comes together and it's golden. This was that moment in The Chocolate Touch. "He meant that word she couldn't find." Honestly. It's a wonder I got anything at all done in the time I spent with Jaime and Dom and their Paris. Reading The Chocolate Touch was like sampling one of Dom's wild creations, at once intimate and unexpected, leaving you only wanting more. The Chocolate Touch is due out July 30th. I could use some bibliocrack!!! Will add it to my steadily growing list! Laura's books just keep getting better and better. I read this one today and loved it! I really appreciate romances that aren't just about getting into bed, and this was so much more than that--really about two people healing each other. In short: YAY. So do I, Maureen. Laura's brand of depth and loveliness is just very much my style. I did read it. And while I enjoyed it, it didn't wow me like Thief, Kiss, and Touch did. The two leads didn't linger with me the way the others do. Something about the Paris books hits the sweet spot for me, I guess. Laura Florand crafts these moments so delicately that they drift down on the reader like so much fairy dust, making your heart throb in time to the beat of her words. And delicious is the best way to describe this series. I highly recommend it! I love your enthusiasm! I've put these on hold and take your recommendation pretty highly and will have to get on them. :) By the way, Harmons in Draper sells macarons. Surprising, I know. They're not bad either (and I've had Lauderee's masterpieces). Maybe I was just happy to find one locally and was willing to settle? :) Can't wait to read these! Thanks, Becky! These books are too much fun not to gush about. I think you'll like them a lot. THANK YOU FOR THE MACARON TIP. I am now plotting to get up to Draper sometime this weekend. I've only read The Chocolate Kiss - but I think I'd better get caught up! Yep. Don't want to miss the other two. So much swoony Paris goodness. As always, it makes me happy when you end up loving a book that I’m excited about. 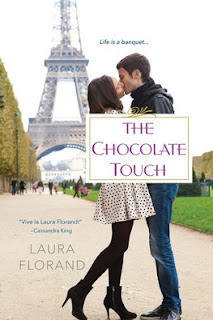 Isn’t Laura Florand amazing? It’s just so much fun to read about her characters, they’re all so distinct and different from each other. I’ve been looking forward to The Chocolate Touch ever since I finished The Chocolate Thief and found out that Cade’s sister and Dominique Richard have a story of their own. I’m currently in the middle of this one and really enjoying it. That scene that you highlighted is one that gave me a warm, fuzzy feeling. I wonder what are the other scenes in the other books where you felt like everything came together? I am eternally grateful to you for directing me to these books!! She's become a comfort read author so fast it almost makes my head spin. And I completely agree, as soon as I heard this one was going to feature Dominique I was sold. There's no way I didn't want to know more about him from his cameo in THIEF. The scene in KISS is the one I quoted in my review, where Philippe goes to her room and they argue over her sending the women after him. Exquisite. In THIEF it's the one where they are both eating at the same restaurant. He's with his friend, but he spends the whole time watching her eat her ravioli. SO GOOD. After "The Chocolate Kiss," my reading this one is a foregone conclusion. Glad it's high quality. I just finished The Chocolate Touch last night and it was glorious! I must have re-read the excerpt on her website a dozen times before Netgalley let me download it. Wasn't it? *sigh* Dom and Jaime were so great. I’m eternally grateful to Michelle for recommending these to me! And it makes me happy that you love these books just as much as I do. It’s rare for me to recommend something that you end up loving, it’s nice to have our roles reversed sometimes. :P Like you said, I wanted to read about Dominique’s story right after seeing him in The Chocolate Thief. Oh those scenes are lovely, I remember both of them. Didn’t you love seeing Cade, Sylvain, Philippe and Magalie in this one? I do agree that this series has very quickly been classified as a comfort read for me. I love discovering series like that. I *loved* seeing them all in one room in this one. She handled all those dominant and colorful personalities so well, reminding you how much you love Sylvain, Cade, Philippe, and Magalie without letting them overwhelm Dom & Jaime's story. This is such a good series. She's a wonderful writer, and her characters are so real. It's a bit hazardous to my health, though - after finishing The Chocolate Thief I ate about 9 Hershey bars in one week because I was craving chocolate (and my budget sadly doesn't stretch to fancy French chocolates)! Sigh, I was kind of putting off reading this review because I knew I was going to have to go buy something afterward. Yup, going off see about buying the first in this series. It's probably time anyway - I've only been hearing about these book for the past couple of months.. I just LOVED your review. I just finished The Chocolate Touch myself last night. It was full of yummy goodness of several different varieties. I did not know there were other books in this series. I am going to have to check them out too. Finding the right gourmet dark chocolate to nibble on while I read them will be an adventure too. I just started my own book blog and I applaud you on yours. It looks wonderful and you write the kind of reviews I like to read. Thank you so much! Wasn't it just a lovely read? You most definitely need to check the other two out. I love them both, though I'll give KISS the edge because wow. Congrats on the blog, btw! I look forward to checking out your posts and reviews. Happy reading. Are you?! Yay!! She really is the master of a scene that LANDS. So, so happy you're loving it, Alexa. So I had to wait until I finished this book before reading your review in full (cause I like NOT KNOWING) and I have to say yes and double yes to everything you wrote. TOUCH has definitely become my new favorite of all Florand's books. The pairing of Dominique and Jamie works so dang well. It just hits the all right notes at exactly the right moments. Definitely have to go in NOT KNOWING. :) And that is exactly what makes Florand awesome--she hits the right nights at all the right moments. I was half in love with these two before I had a handle on who was standing where. Ack! Sorry for the snippet-stealing. It's the best moment, isn't it? I mean, like a high C for sure.